Download "Jeffrey Krug, PT, MS Clinical Instructor Department of Physical Therapy University of Missouri"
2 SCOLARLY ACTIVITY Peer Reviewed Publication Sayers, S and Krug, J. Robotic Gait-Assisted Therapy in Patients with Neurological Injury. Missouri Medicine. March/April 105(2): Professional Presentations/ Invited Lectures Krug, J. Insights into Clinical Teaching. MU School of Health Professions Award Winning Faculty Lecture. Presentation. March 31, Krug, J, Bridges, J, Gibson, K and Guest, Y. Integration of a Pro Bono Clinic into a PT Curriculum. American Physical Therapy Association Combined Sections Meeting. Two Hour Presentation. February Krug, J., Hughes, L., Sureck, L., Wideman, K., Mueller, R. NeuroPhysZOU: Benefits of a Pro Bono Neurological Physical Therapy Clinic. American Physical Therapy Association Combined Sections Meeting. Poster Presentation. 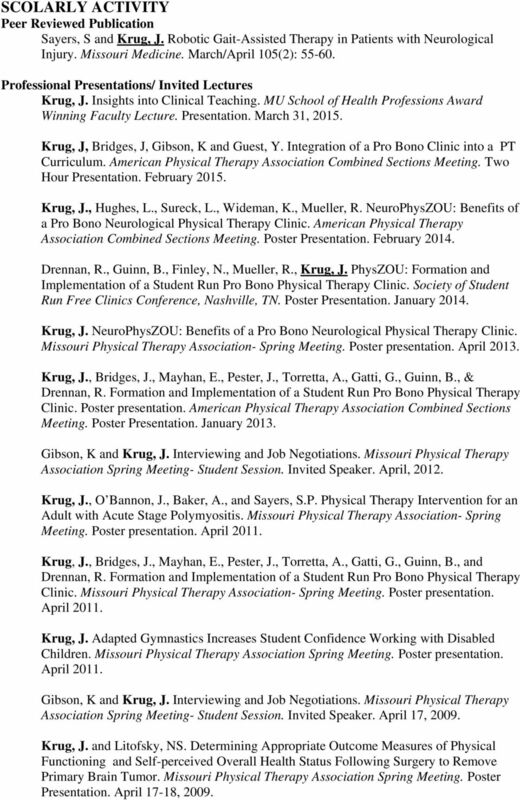 February Drennan, R., Guinn, B., Finley, N., Mueller, R., Krug, J. PhysZOU: Formation and Implementation of a Student Run Pro Bono Physical Therapy Clinic. Society of Student Run Free Clinics Conference, Nashville, TN. Poster Presentation. January Krug, J. NeuroPhysZOU: Benefits of a Pro Bono Neurological Physical Therapy Clinic. Missouri Physical Therapy Association- Spring Meeting. Poster presentation. April Krug, J., Bridges, J., Mayhan, E., Pester, J., Torretta, A., Gatti, G., Guinn, B., & Drennan, R. Formation and Implementation of a Student Run Pro Bono Physical Therapy Clinic. Poster presentation. American Physical Therapy Association Combined Sections Meeting. Poster Presentation. January Gibson, K and Krug, J. Interviewing and Job Negotiations. Missouri Physical Therapy Association Spring Meeting- Student Session. Invited Speaker. April, Krug, J., O Bannon, J., Baker, A., and Sayers, S.P. Physical Therapy Intervention for an Adult with Acute Stage Polymyositis. Missouri Physical Therapy Association- Spring Meeting. Poster presentation. April Krug, J., Bridges, J., Mayhan, E., Pester, J., Torretta, A., Gatti, G., Guinn, B., and Drennan, R. Formation and Implementation of a Student Run Pro Bono Physical Therapy Clinic. Missouri Physical Therapy Association- Spring Meeting. Poster presentation. April Krug, J. Adapted Gymnastics Increases Student Confidence Working with Disabled Children. Missouri Physical Therapy Association Spring Meeting. Poster presentation. April Gibson, K and Krug, J. Interviewing and Job Negotiations. Missouri Physical Therapy Association Spring Meeting- Student Session. Invited Speaker. April 17, Krug, J. and Litofsky, NS. Determining Appropriate Outcome Measures of Physical Functioning and Self-perceived Overall Health Status Following Surgery to Remove Primary Brain Tumor. Missouri Physical Therapy Association Spring Meeting. Poster Presentation. April 17-18, 2009. 3 Krug, J. and Wingert, K. Integrating Cultural Competencies into a PT Curriculum: Cultural Awareness Through Conversation Hours. Poster Presentation. American Physical Therapy Association Combined Sections Meeting. February Krug, J. Spasticity Management: Focus on the Patient. Evidence-Based Updates for Clinical Practice, University of Missouri. Invited Speaker. October 9, Karen Funkenbush, and Krug, J. Farming with Arthritis. Maryland-Delaware AgrAbility Conference. Invited Speaker. December 3, Wright, E., Krug, J., and Brittain, L. Cerebral Palsy: Motor Impairments and Their Management- A Team Approach. MedSourceOne Sponsored Lecture. Invited Speaker. October 3, Krug, J. and Krug, G. Casting, Splinting, and Positioning of the Patient with Spasticity. Oklahoma Physical Therapy Association Annual Meeting. Invited Speaker. February, Krug, J. and Krug, G. Casting, Splinting, and Positioning of the Patient with Spasticity. State of the Art in Managing Spasticity of Cerebral Origin conference prior to inaugural meeting of International Spasticity Research Association. Invited Speaker. September 21, As part of Traumatic Brain Injury Rehab Team from Rusk Rehabilitation Center. The Team Approach to TBI Rehab. Missouri Head Injury Advisory Council Conference. Invited Speaker. May 21, Physical Therapy Treatment of the Individual with TBI. Medical Grand Rounds at University of Missouri Medical School. Invited Speaker. March Physical Therapy for the TBI Patient- 3 lectures and 6 labs. 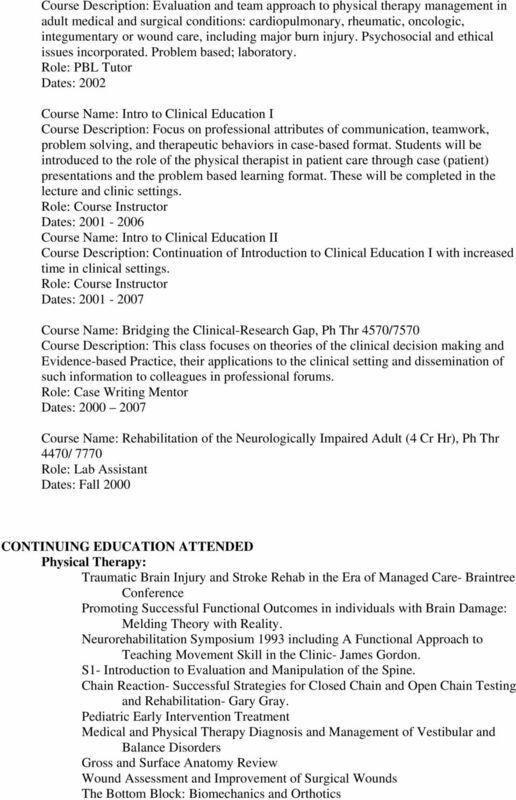 University of Missouri PT Program: PT 346- Rehabilitation of the Neurologically Impaired Adult. Invited Speaker. 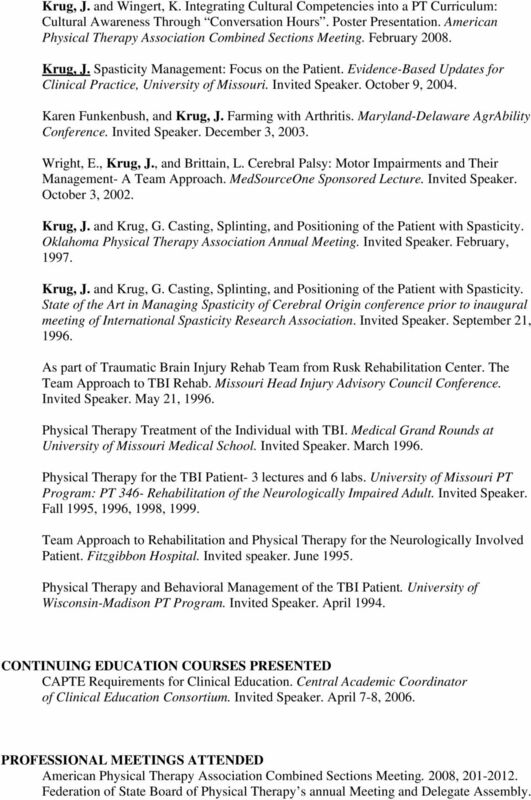 Fall 1995, 1996, 1998, Team Approach to Rehabilitation and Physical Therapy for the Neurologically Involved Patient. Fitzgibbon Hospital. Invited speaker. June Physical Therapy and Behavioral Management of the TBI Patient. 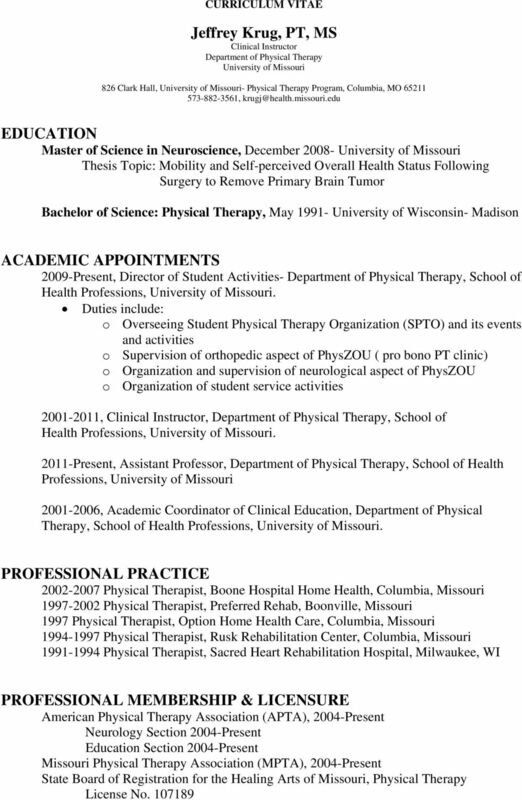 University of Wisconsin-Madison PT Program. Invited Speaker. April CONTINUING EDUCATION COURSES PRESENTED CAPTE Requirements for Clinical Education. Central Academic Coordinator of Clinical Education Consortium. Invited Speaker. April 7-8, PROFESSIONAL MEETINGS ATTENDED American Physical Therapy Association Combined Sections Meeting. 2008, Federation of State Board of Physical Therapy s annual Meeting and Delegate Assembly. PTHA 2535. Rehabilitation ********** PHYSICAL THERAPIST ASSISTANT PROGRAM HEALTH OCCUPATIONS DIVISION LEVELLAND CAMPUS SOUTH PLAINS COLLEGE. PHYSICAL THERAPY. Doctor Physical Therapy (DPT) situations. DEPARTMENT OF PHYSICAL THERAPY VISION International leadership in education and research in Physical Therapy and Rehabilitation Science. CURRICULUM VITAE. 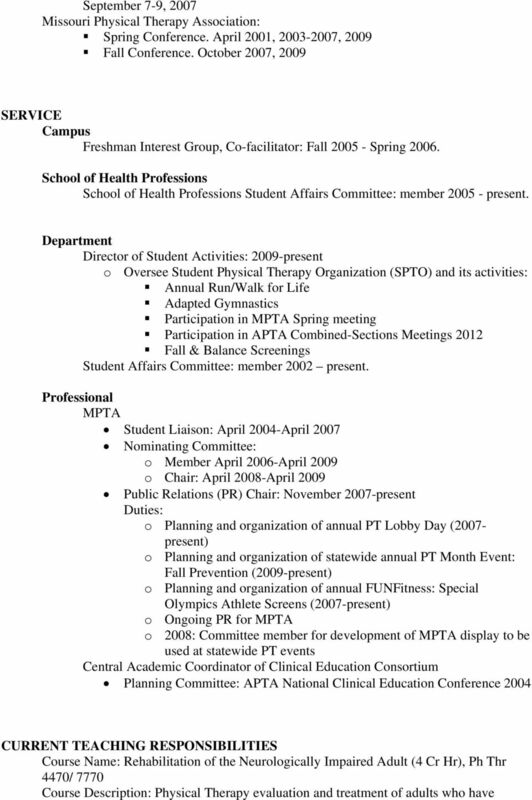 Jon Joseph Rizzo, MSPT, ATC/L, CSCS 66 Briarwood Drive Manchester, CT 06040 (860) 830-1146 Email: jon.rizzo@uconn.edu. CURRICULUM VITAE. 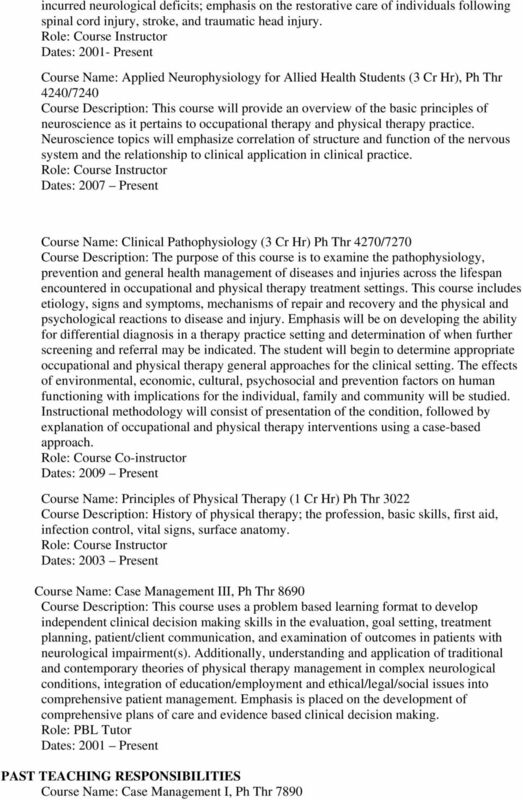 Iowa City, IA 08/00 to 12/05 Physical Rehabilitation Science. Iowa City, IA 08/96 to 12/98 Physical Therapy M.P.T.